Nirensei means roughly "two star (point)s in a row" in Japanese. It is the name applied to the formation below. It is a very common beginning for both Black and White in modern Go. Despite its presence in handicap games for hundreds of years, it was not commonly used as an even-game fuseki until the New Fuseki Era in the 1930s. 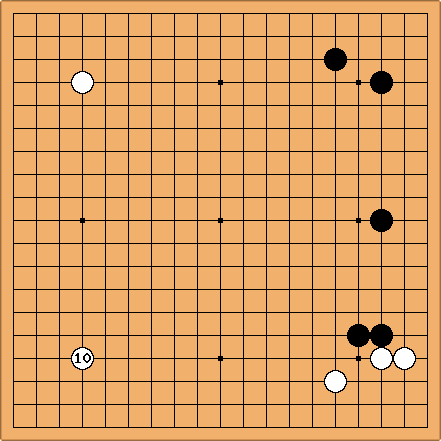 Both Black and White begin the game by playing nirensei along opposite sides of the board. This is a very common start in both professional and amateur games. Note that if Black wants to play nirensei, White cannot prevent it. Once is on the board, Black will certainly be able to play in one of the two adjacent corners (either at or at ). More advanced discussion is at nirensei v nirensei. If next Black plays at a the fuseki is called sanrensei (three starpoints in a row). 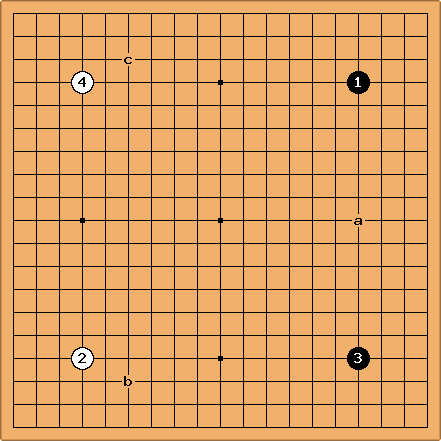 Nirensei is used to describe the fuseki when Black chooses another course, for example, approaching the white stones with b or c.
Nirensei is a very fast, flexible approach. Black (or White) sketches out the briefest of frameworks along one side and then turns elsewhere. It is still very common in amateur Go but in recent years it has become less popular among professionals. When White responds with her own nirensei as above, Black has not been able to create a consistent advantage sufficient to overcome the komi. The oldest known non-handicap game where a professional player plays nirensei, is this game by Honinbo Shuwa (white) in 1838 against Yasui Sanchi. It is remarkable that the first professional occurence of the nirensei pattern was playing white. It was not before 1933 (Go Seigen vs. Kitani Minoru) that we see black playing his first two stones as nirensei.